I thought that by moving to Scotland I’d be a bit further away from William and Mary than I’ve been used to for the past four years, but while the physical distance between me and the colonial capital may have increased, William and Mary is as present as ever in my life. In ways both noticeable and less so, the College left me with friends, grounding, confidence, a community and the ability to thrive and make the most of novel opportunity. William and Mary taught me the meaning of persistence. Your relationships from W&M will be with you, Now & Always. I’ve spent time in St Andrews and Edinburgh with alumni Brit Fallon ’11 who is pursuing her PhD at St Andrews studying chimpanzee communication. I’ve caught up with a cohort of the W&M students studying abroad at Scottish universities this semester. Last week I stayed up until 2 a.m. GMT/BST so that I could take part via Skype with the Young Guarde Council and Alumni Chapter Representatives fine-tuning last minute details for what promises to be an amazing homecoming weekend. This past weekend, I traveled down to London to take the LSAT and was hosted and hung out with the family of a fraternity brother from W&M. I took the LSAT just a stone’s throw away from St Paul’s Cathedral in the city, where Sir Christopher Wren, who designed both the famous Cathedral and the arguably more agreeable Wren Building at W&M, is buried. This Saturday, I’m headed west to Glasgow to spend the day with a fellow W&M alumni, Hayley Rushing ’11, who is pursuing her MLitt in Master’s and Playwriting at the theatrical powerhouse. 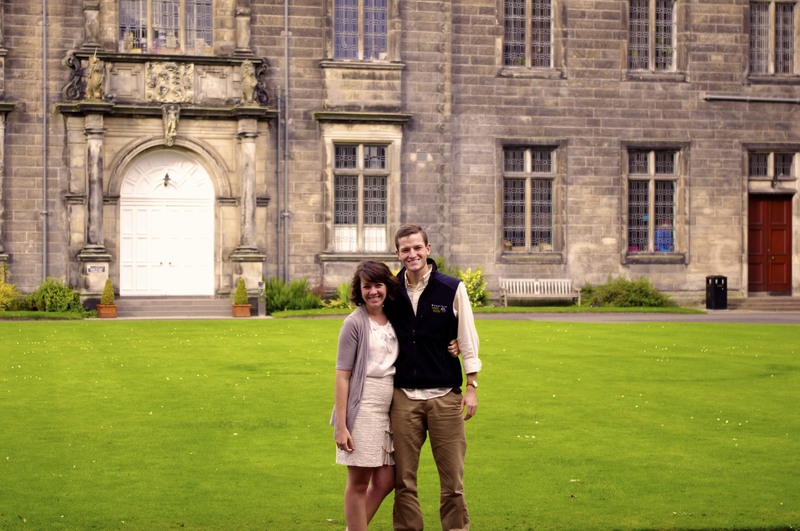 A week from today, I’ll head up to St Andrews where William and Mary has a joint degree partnership. There, I’ll be catching up and breaking bread with Jodi Fisler M.Ed ’05, Ph.D ’10, the Assistant to the Vice President for Student Affairs who will be in St Andrews working on the degree program. In 19 days, I’m flying to Porto in western Portugal where I’ll meet up with a W&M alumni taking a year off between undergraduate and law school to live and au pair in Paris. We’ll spend four days relaxing on the Portuguese coast and likely reminiscing about W&M. 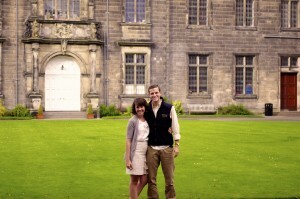 For a week in November over Thanksgiving fellow blogger Bailey Thomson ’10 will be visiting me in Edinburgh. The packed schedule includes a potential trip down to London for Thanksgiving day for an expatriate meal in the city with other fellow W&M alumni. Later in the year I have plans to visit several other alumni who are attending graduate school, pursuing Fulbright scholarships, and doing democracy monitoring in Florence, Bulgaria and Bosnia respectively. This past Saturday I was interviewed for a law school by one of its alumnus. The interview, which was probably supposed to be a quick assessment of my fitness for law school, lasted almost an hour and a half as the successful alumni and I discussed and laughed about everything possible regarding school, undergraduate education, current events and life in the UK. My education at W&M taught me that those who have a human touch will always accomplish more than those who lack it. As a result of my time and opportunities at W&M, I thrive in interview settings. I am interning and doing research for an MSP at the Scottish Parliament. My time at William and Mary that I spent interning in the Virginia General Assembly and coordinating the College’s Richmond Interns program taught me everything I would need to know to work in any political environment – even if that environment is in a different country. 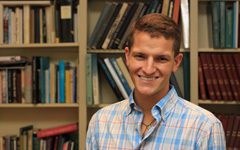 My time at W&M furnished me with the experiences necessary to interview my way into an internship position otherwise not open to students and the ability to work with the majority nationalist party despite being a foreign national at a truly formative time in Scottish history. My research experience from W&M allows me to turn out politically, linguistically and legally important research and has given me the opportunity to potentially transform my masters dissertation research into a motion that will be of political benefit to my MSP and wind up becoming a motion before the sitting Parliament. Next week I am meeting with the Directors of Development and Alumni Engagement at Edinburgh to discuss developing an internship wherein I’ll be able to put into practice a number of the things I learned at William and Mary in Development and the Alumni Association. On a whim I sent an email to the directors of the respective initiatives. I got an email response saying they’d never had a student reach out with such interest and had recently been talking about how nice it would be to take on a selected student who would have the opportunity to work with the trust and development boards as well as the alumni association to achieve new levels of student/administration collaboration. William and Mary taught me that if there’s something you want to do that doesn’t exist – create an opportunity for yourself. Perhaps the reason W&M has been on my mind these past few days is the most obvious of all: in 11 days I am boarding a flight headed back to Williamsburg for 4 days to enjoy homecoming. The missed class, layovers and jet lag don’t deter me at all. My journey will involve trains, taxis, buses, cars and airplanes. But nothing bothers you when you’ve been away and you finally find yourself returning to the place and people that created, well, you. That’s an odd sensation, isn’t it? Returning to the place where the ‘you’ that you’re familiar with started; to the people you were with when it happened. I owe a great deal of myself to the circumstances of William and Mary. My gmail has been blowing up with messages to and from fellow alums exchanging our plans and excitement for the weekend. Elaborate schemes are hatching. Even my parents are coming down for events and meals. Out of all the exciting places and new opportunities presenting themselves in October, it’s safe to say none are more exciting than the prospect of returning. On October 20-23rd there’s nowhere else in the world I’d rather be than William and Mary. I’ve been thinking to myself: In 11 days, I’ll be home.